Descubra o verdadeiro significado da frase "Pão e Circo" enquanto viaja de volta no tempo em um tour privado pelo Coliseu Romano. Seu guia descreve o significado deste marco mundialmente famoso, como você imagina a Roma Antiga com suas gloriosas lutas de gladiadores e multidões encantadas. Desfrute de transporte de ida e volta conveniente e acesso sem fila, bem como o serviço personalizado de um guia turístico profissional. This was absolutely one of the best tours I've ever taken. 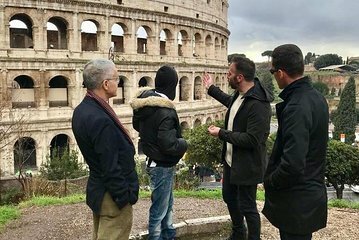 Part of it was due to the location of the tour the amazing Colosseum and Forum, but the majority of what made this tour so incredible was our guide. She had done this tour countless hundreds of times, but was still very visibly excited about the topic. She gave such a vivid depiction of the past that we had no problem imagining what it must have been like to live in Rome at that time period. The only problem: After spending three hours with this guide, I never got her name! So...if anyone from Viator is reading this, please note that the guide from our specific tour was nothing short of fantastic!!! Wonderful guide who was really thoughtful and took the time to answer all our questions in addition to countless things we learned from her. The Colosseum and The Forum were both outstanding. Spend the money, you won’t regret it!